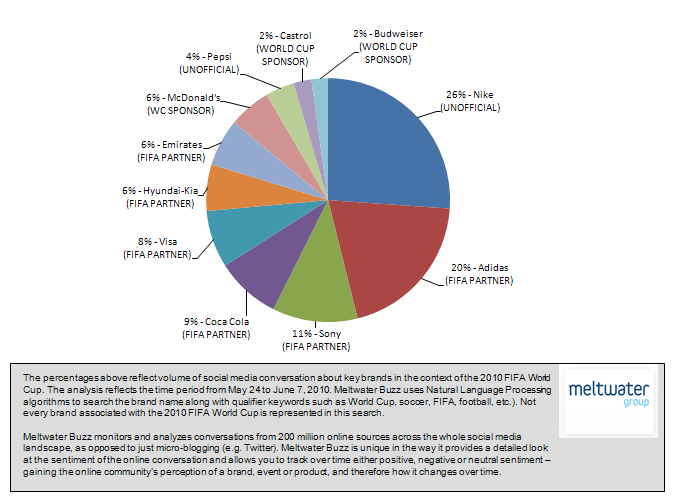 The marketing and media efforts of FIFA World Cup sponsors and advertisers during the run-up to the tournament have been discussed previously in this blog. Now that the tournament is over, it’s an appropriate time to analyze the most interesting aspect of World Cup marketing this year, which involved the intense competition between sporting goods companies Adidas and Nike. Adidas has a long-standing relationship with FIFA and the World Cup that goes back more than 30 years. As an official partner, the referees’ uniforms and the balls are Adidas-branded, along with the ads around the playing field and on television during the matches. Nike, which was not an official sponsor, had to be creative in order to be competitive with Adidas. The company’s approach was to launch a viral “ambush” campaign on its Facebook page prior to the start of the tournament. Its “Write the Future” ad featured players from several countries who imagined how their lives would change if they starred in the World Cup. By launching the ad on the company’s Facebook page before it ran on television, Nike created a buzz that saw its number of followers on Facebook double within the first week. The volume of coverage is of course important in marketing, but so is the quality of the coverage. Fortunately for Nike, much of the social media buzz generated by “Write the Future” was favorable, with numerous people recommending the ad in public forums or sending the link to friends. Adidas saw its biggest spike in coverage shortly before the start of the tournament in June, but much of the coverage – both in social and traditional media – concerned criticism of the Jabulani ball Adidas created for tournament. This negative coverage is proof that the quantity of coverage doesn’t necessarily translate into advertising value equivalency (AVE). Of course, both companies wanted the teams and players they sponsored to succeed and there’s a certain cachet for outfitting the top teams. Performance probably wasn’t a critical factor, however, since Nike generated the buzz they wanted prior to the tournament and only hard-core fans focused on the disappointing performances of such players as Wayne Rooney, Franck Ribery and Christiano Ronaldo, who were featured in the ads. So who is ultimately the winner? It’s hard to find much wrong with Nike’s strategy, since they didn’t have to pay the $125 million partnership fee; much of the publicity for their campaign was generated by consumers; and they managed to receive more media coverage than all of the paid sponsors, except Adidas. On the other hand, Adidas may be able to overlook all of the costs and controversies it encountered, since the ultimate image of the tournament will be the Spanish team raising the World Cup trophy – clad in Adidas jerseys. David Breg is a media consultant based in Washington, D.C.